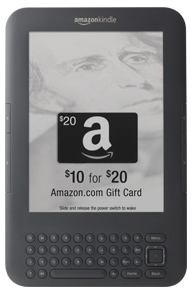 One of the ways that Amazon has managed to bring down the price of their Kindle eReader to a point that nobody else has been able to match is through their Special Offers. This feature saves customers $30 – 40 on their new Kindle by displaying advertisements in place of the otherwise uncustomizable screen saver images that the device carries by default as well as on the bottom of menu screens. In doing so, Amazon makes enough off the ads, in theory, to offset the discount and maybe even get word out about useful offers they could be interested in. One of the most notable initial offers was that of a $20 Amazon.com gift card for only $10. This was only available to active Kindle w/ Special Offers owners and got a fair amount of press at the time as a smart move on Amazon’s part. Other ads have included Buick, Olay, Visa, ABC, and more. There was, and for some still is, some question as to how effective this advertising method would prove to be in the end, but responses are coming in from Advertisers that put that to rest for the time being. For example, while Buick was mainly concerned with building a connection in customers minds between their brand and what they viewed as an innovative new product (the Kindle), they have been reported as noting that their customer engagement matched what they’ve come to expect from other, more established media. ABC’s promotion also went well, with over 24,000 people taking advantage of their free script offer in support of new show “Revenge”. In the past month, however, people in supported areas might note having seen a focus on the new Amazon Local service. This is meant, by all appearances, as Amazon’s own competition for the popular Groupon site. Nationwide offers in such areas have been somewhat scarce as a result. This has led some to jump to the conclusion that Amazon has been having trouble finding people interested in advertising via Kindle. One Amazon advertising VP, however, was able to come right out and say that there has yet to be a drop in the number of interested advertisers. In spite of the fact that this appears to be a fairly narrow media venue to exploit, the Kindle has brought reading back to the front of peoples’ minds in a way that many wouldn’t have believed possible five years ago. Millions have been sold and, while Amazon does not and is unlikely to ever, release sales numbers for the Kindle, it is safe to say that several of those millions had the Special Offers included. These devices are cheap, allow for an unhindered reading experience wherein ads will never appear to disturb you, and can even come in handy when bringing deals to your attention. Personally, I was just glad to stop seeing the same dead author portraits over and over again. It seems clear that while there is expansion to be done and experience to be gained, this was a smart move on Amazon’s part. This entry was posted in Amazon, Kindle 3, Kindle 4, Kindle Touch and tagged ads, Kindle 3, kindle 4, Kindle Offers, screensavers, special offers by matthew. Bookmark the permalink.